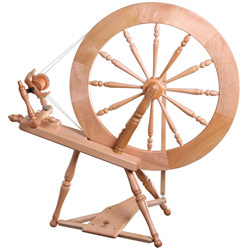 I had decided I could manage without a raddle, but quickly changed my mind. So what's a raddle and why do I need one? 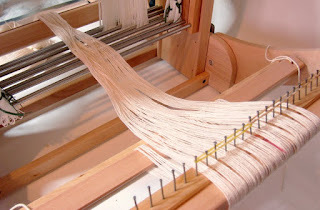 It's a stick with pins in it and it keeps your warp nice and even as you wind it onto the back of your loom. It's so useful, the question should probably be why isn't it included with my loom; especially as it's shown in the instructions? The cynical answer might be that they can then sell us something else, or to keep down the cost of the loom. It's also true to say that not everybody will need one, only if you thread from the back. The bought raddles are finished nicely and come complete with some extras, but are not cheap. If we weren't good with our hands, we wouldn't be weaving. Making one is very simple, you just need to tap some panel pins into a piece of wood. It took me about ten minutes including smoothing the edges of the wood and waxing it. Cut a piece of wood the length that you want your raddle to be. The other dimensions don't really matter, as it'll be tied to your loom. Mark a centre line so that your pins are nicely lined up, mark points along that line, starting in the very centre. (The Ashford raddle has its pins half-inch apart, I've gone for 1cm. ) Remember that tapping pins into the wood closely together along the same line (probably along the grain) is a great way to split the wood, so take care to avoid this. One trick is to blunt the pointed ends of the pins with your hammer before tapping them in. I've marked my centre pin with a piece of red cotton, and used some elastic bands to hold the warp in. I must give credit to sweetgeorgia for her post which I have mentioned in a previous newsletter. I used panel pins, and have made two now, one with half inch spacing and one with quarter inch spacing. 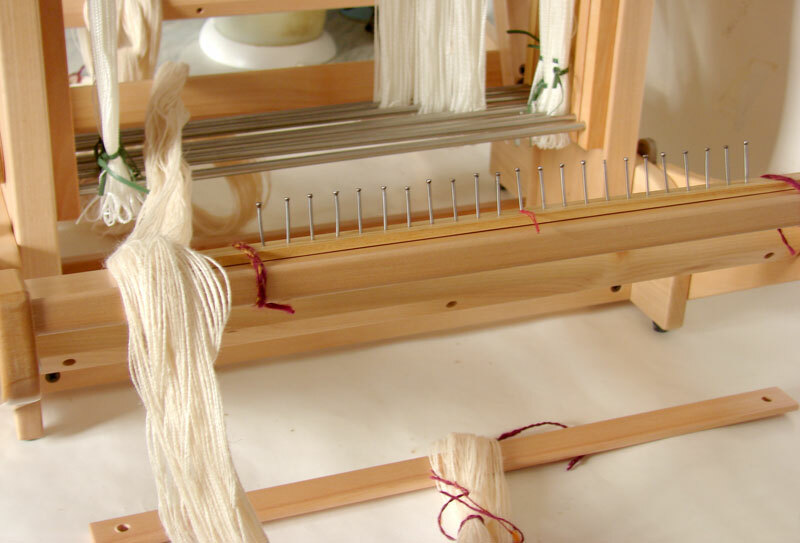 I use inches rather than cm as my reeds are not metric, and all my warp calculations for the width are in inches, although I use metres for the length! Hi Dorothy, thanks for that, I hadn't found your blog post before; it would have helped if I had! Also at school in the 70s, I desperately wanted to do woodwork with the boys, but had to do needlework and knitting instead. Funny how things turn out...I did an Adult Ed class in woodwork for several years. wow, was THIS hard to find. then again, if i knew how to spell the word in the first place, it probably would have helped. anyroad, thanks for making it so easy! especially since i'm working on constructing my own loom (not enough brass in the coffer to buy one)as well as the accessories to match. i may be an yank by birth, but i loath the imperial system with a passion and was chuffed to bits when i saw you posted the spacing in metric.